Rocky Tops has been established in Grand Junction since 1993 and has been through three owners. Most recently, it has been acquired by Krystal Mitchell, 30, and Donnie Sondgeroth , 31, in October of 2017. Krystal was born and raised in Grand Junction, CO along with her two older siblings. Her father was a local business owner and her mother worked for School District 51. Much like many that have grown up locally, she was raised camping in the Grand Mesa National forest along with the regular pilgrimage to Lake Powell in Utah. While attending Grand Junction High School, Krystal began taking alternative classes in Graphic Design at UTech, now known as Western Colorado Community College. Having found her passion, she proceeded to Mesa State College promptly after graduation High School in 2006. Despite being preoccupied with being a full-time student, she still maintained a full-time job working for School District 51 as a custodian. Any spare moment she had was dedicated to her studies, even if it meant doing homework on her breaks at work. In retrospect, she says, “I still don’t know how I did it”. She was one of the lucky few that started in a college and graduated from a university with out ever having to change schools as Mesa State College gained its university status during her tenure. With her graphic design degree in hand, Krystal applied to work for The Daily Sentinel where she was employed for from 2012 to 2017 as a graphic designer. While in the throes of her early years of college, Krystal reunited with an old classmate from High School, Donnie Sondgeroth, through mutual friends that had been dating. The two seldom crossed paths during their tenure at Grand Junction High School but as fate would have it, they found themselves in one another’s company regularly thanks to their friends. It didn’t take too much convincing for either to become partners in crime. Donnie, like Krystal, spent most of his formative years growing up in Grand Junction, despite being born in Aurora, CO. His parents relocated to the Western Slope when he was the young age of 3. Through out his High School career at GJHS he immersed himself in in everything sports, baseball being his focus, despite coming from a family of wrestler. At 16, Donnie started working at City Market filling in where ever needed, but mostly stayed at the 1st street location. Following graduation, he continued working there until it’s unfortunate closure. Despite having the opportunity to move to other City Market locations in the valley, Donnie decided to see what else our corner had to offer in the way of work. He tried everything from working as an electrical apprentice to working as a Dish Network Technician. By the end of his vocational tour, he landed a job working for School District 51 in the grounds department. After 8 years of faithful service in 2017 to the district, he gave his notice. 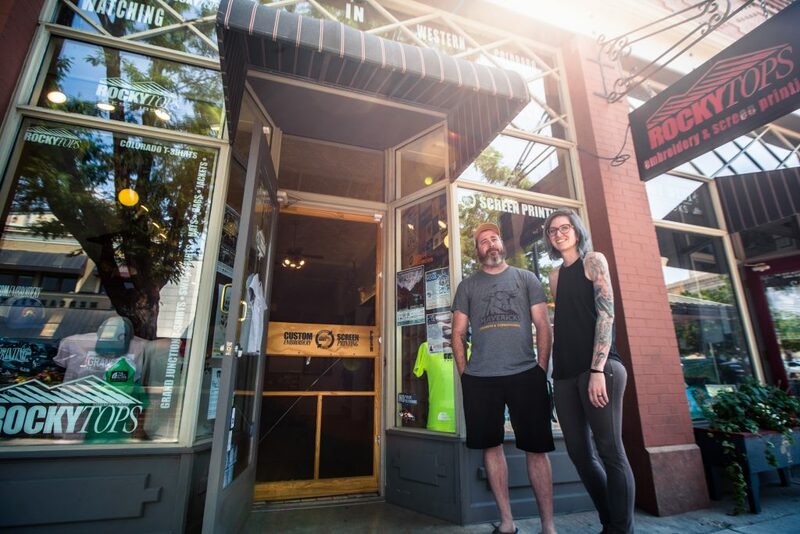 Having minimal experience in screen printing, curiosity on their side, and a plan for what one could call a “side hustle”, Donnie and Krystal decided to explore the world of screen printing tee-shirts. While researching DIY (do-it-yourself) equipment on the internet, they stumbled upon Spencer Pike’s advertisement offering up for sale his screen printing and embroidery shop- Rocky Tops. The two took a weekend to seriously weigh their options before contacting Mr. Pike about potentially purchasing his business. Despite wanting a change in pace for himself, his wife and young kids, Spencer held on to the integrity that he had instilled in his business practices over the years and was insistent that when the business exchanged hands that it would require the right captain (or captains in this case). Having determined that Krystal and Donnie were the right people to uphold his standards for Rocky Tops, Spencer passed the torch to them, but not without taking 3 months to work along side them to make the transition as smooth as possible for the new business owners. While Krystal worked the morning preparing the day’s work load, Donnie continued his daily work load with the school district to ensure their success in their seemingly risky jump. After 8 years of faithful service to School District 51, he gave his notice. Now 9 months in, the two have met every demand, increased their equipment inventory and have widened their bottle necks better serve their home- The Grand Valley.